It wasn't possible to fully explore BonBon-Land on either of my two previous visits to the park, and thus one can imagine my excitement ahead of our visit today. It was officially on the to-do list anyway thanks to the reinstallation this year of Kaninus (#1232), but in all honesty I'd have happily revisited even without the prospect of another new credit. 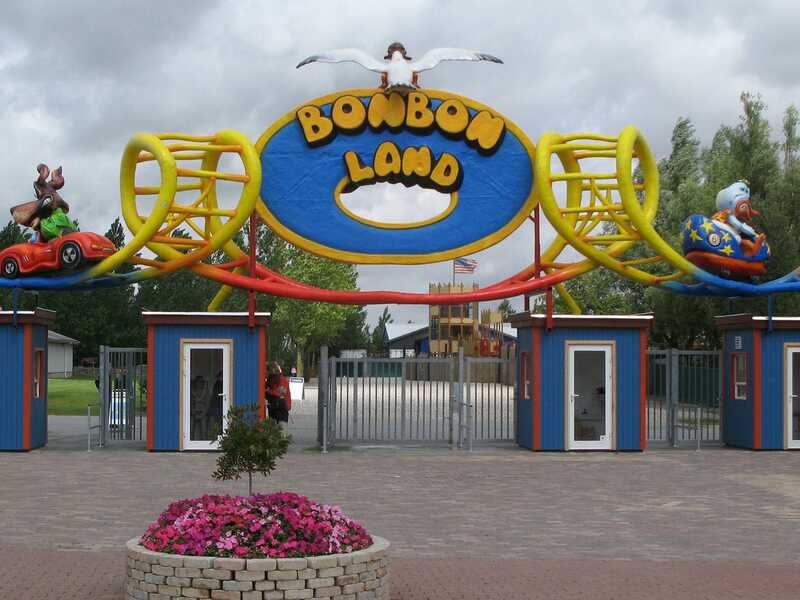 The reason is one that will be clear to anyone who has ever visited the home of the Dog Fart Roller Coaster; the theming in BonBon-Land is extremely entertaining in a scatological sort of way. Some spectacularly bad weather had largely burnt off by the time I boarded the Water Rat flume ride, though the after effects were still present in the guise of a full two inches of water in the bottom of my boat. George put it rather nicely in the quote of the day; I don't suffer from tourettes syndrome, but it'd be fuzzing handy sometimes! Wet socks might have been forgivable were the flume actually worthwhile, but this one frankly wasn't; the boats moved extremely slowly turning a relatively short track into a fifteen minute ride. On the other hand, the Beaver Rafting ride was certainly one of the better rapids rides I've been on, thanks to it following a route through a wooded area that for the most part felt like a natural river rather than an amusement park. The design ensured that riders didn't get particularly wet, though it looked to me like this could easily be tweaked dependent on weather conditions. Andy seemed particularly taken with this ride given that he completed three laps of it! On the coaster front, we managed a perfectly balanced ride on our third attempt at Hankatten, and the result was an absolutely wickedly intense ride. None of us could walk in a straight line on disembarking, with even the trek to the nearby park bench proving an interesting challenge. Vild-Svinet was also running well, though once was my limit thanks to the after effects of our earlier spin. The last ride of the day was taken on the Cobra Tower free fall, and Andy's piercing scream left me with a hilarious memory to remember Denmark by.